These wedges are potato perfection! Baked until crispy and topped with cheddar, chives, and an avocado sour cream sauce. 1) Preheat oven to 400 degrees F. Cut potatoes into wedges. You should get 10-12 wedges per potato. Toss wedges with olive oil, salt, pepper, and garlic powder. 2) Line a baking sheet with parchment paper and spread potatoes out on the baking sheet. Try to make sure that they aren’t stacked at all. Baked potatoes for 35-40 minutes, flipping once halfway through. Finished wedges should be crispy on the edges and sides and tender in the center. 3) While potatoes bake, stir together mashed avocado (really ripe) and sour cream. You can also pulse in a small food processor. Add lime juice and a pinch of salt. Also cook bacon and crumble and grate cheese. 4) When potatoes are baked, re-position the potatoes so they resemble shingles on the sheet pan. They should slightly overlap. 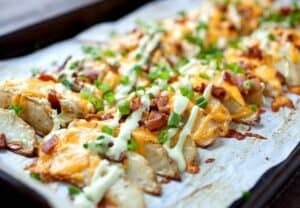 Top potatoes with cheese and crispy bacon. Return to oven for 5-6 minutes until cheese is bubbling. 5) Finish potato wedges with avocado sauce and fresh chopped chives (or scallions). Serve while hot! This delicious recipe was brought to you by Macheesmo. Read the full post at https://wp.me/pkSYO-dh5.